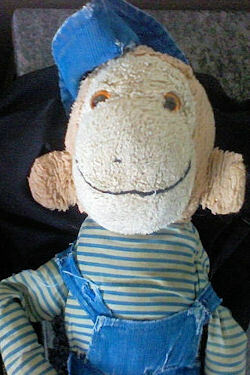 I am looking for the 80’s Commonwealth 23 inch Curious George monkey. He’s wearing a blue striped shirt, blue dungarees, and a blue hat. Obviously this was a popular stuffed toy that people are looking for. My son got this on his first birthday, and it became his lovey that we called Weezy. A so called friend of mine was supposed to ship things to me after we moved from Ohio to California. Instead he sold or threw out baby memories, photos, family keepsakes and special things I was saving for grand kids. I would love to find this monkey!! I found him! I have this commonwealth monkey!!!! The one I have has blue corduroy overalls with white and blue striped shirt. He has a blue corduroy hat on. He does show some aging as he is old. I can send a picture if you are still looking!